1995 Fadal VMC15RT mdl. 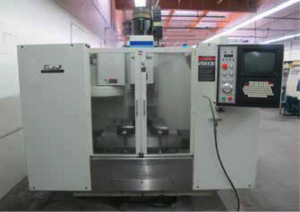 914-15 4-Axis CNC Vertical Machining Center s/n 9508667 w/ Fadal CNC88 Controls, 21-Station ATC, CAT-40 Taper Spindle, 7500 RPM, Rigid Tapping, Hugh Speed CPU, Graphics, 16” x 38” Table, Coolant. 1991 Fadal VMC4020 mdl. 906-1 4-Axis CNC Vertical Machining Center s/n 9103110 w/ Fadal CNC88 Controls, 21-Station ATC, CAT-40 Taper Spindle, 10,000 RPM, 20” x 48” Table, Coolant. 1988 Fadal VMC40 mdl. 904-1 4-Axis CNC Vertical Machining Center s/n 8807635 w/ Fadal CNC88 Controls, 21-Station ATC, CAT-40 Taper Spindle, 10,000 RPM, 16” x 39” Table, Coolant. 1987 Fadal VMC4020 mdl. 904-1 CNC Vertical Machining Center s/n 8707818 w/ Fadal CNC88 Controls, 21-Station ATC, CAT-40 Taper Spindle, 7500 RPM, 20” x 48” Table, Coolant. 2003 Hardinge Talent 8/52 Live Turret CNC Turning Center s/n BLBA3L0114 w/ Fanuc Series 0i-TB Controls, Tool Presetter, 12-Station Live Turret, “C” Axis is Programmable, 5000 Max Spindle RPM, 5000 Max Live Tooling RPM, (4) Live Tooling, Hydraulic Tailstock, Parts Catcher, 8” 3-Jaw Power Chuck, 5C Collet Nose, Chip Conveyor, Coolant, 2147.5 Metered Hours. Hardinge HLV-H Wide Bed Tool Room Lathe s/n HLV-H-15097-T w/ Acu-Rite Master-TP Programmable DRO, 125-3000 RPM, Inch Threading, Tailstock, Power Feeds, Hardinge Tool Post and Holders, 5C Collet Closer, 6” 6-Jaw Chuck, 6” 3-Jaw Chuck, 6” 4-Jaw Chuck, Coolant. Bridgeport Vertical Mill s/n 252596 w/ Newall Topaz DRO, 2Hp Motor, 60-4200 Dial Change RPM, Chrome Ways, Power Feed, 9” x 42” Table. Bridgeport Series 1 – 2Hp Vertical Mill s/n 194479 w/ Newall Topaz DRO, 60-4200 Dial Change RPM, Chrome Ways, Power Feed, 9” x 42” Table. Harig “Super 612” 6” x 12” Automatic Hydraulic Surface Grinder w/ Walker Fine-Line Electromagnetic Chuck. Dayton 2” Belt / 8” Disc Sander w/ Stand. Leten mdl. DCM-6 24” Vertical Band Saw s/n 600286 w/ Blade Welder, 1800 Max FPM. Wellsaw mdl. 850 10” Horizontal Band Saw s/n 2089 w/ 4-Speeds, Manual Clamping, Coolant. Trinco mdl. 48/BP Dry Blast Cabinet s/n 40888-4 w/ Dust Collector. JD Squared Manual Pipe Bender w/ Bending Dies. 1992 Kaeser AB1000 7.5Hp Piston Style Air Compressor s/n 4711354 w/ 35.3 CFM @ 145 PSIG. Kaeser KRD025 Refrigerated Air Dryer. 150 Gallon Air Storage Tank. Tru-Drill 16-Speed Pedestal Drill Press. Central Machinery 36” Hand Brake. Fadal mdl. VH65 4th Axis 6 ½” Rotary Head s/n 3240491 w/ 5C Collet Closer Attachment. Fadal mdl. VH5C 4th Axis 5C Rotary Head s/n 052001070951 w/ Mill Center. Fadal mdl. VH5C 4th Axis 5C Rotary Head s/n 5040995. Procunier “Tru-Tap and Tapmatic 40-Taper Tapping Heads. (15) Kurt 6” Angle-Lock Vises. (68) R8 Tooling and Collets. (11) Huot Drill and Tap Cabinets. Pittsburgh Hydraulic Knockout Punch Set. Milwaukee and Makita Cordless Power Tools. Giddings & Lewis Cordax 1808-M MEA CMM Machine s/n C-6422-1092 w/ Renishaw PH6 Probe Head, “X”=1000mm, ”Y”=625mm, “Z”=500mm Work Envelope,QC-5000 V2.40 Software, Computer. Deltronic DH214-MPC5E 14” Optical Comparator s/n 249093783 w/ Deltronic MPC-5 Programmable DRO, Digital Angular Readout, Shadow Detection Arm, Surface and Profile Illumination, Table. Mitutoyo mdl. TM Tool Makers Microscope s/n 400128 w/ Digital Readout Heads, Light Source. Mitutoyo Surface Roughness Gage w/ Printout. Exact Level 14” Master Level. Gage Blocks and Angle Blocks. Aerospace Bore Mics 2”-2.25”, 1.6”-2.0”, 1.2”-1.6”, 1.0”-1.2”, 0.8”-1.0”, 0.65”-0.8”, 0.5”-0.65”. Yuasa 0-12” OD Mic Set. Mitutoyo and Fowler Digital OD Mics. Mitutoyo and Peacock Dial Bore Gages. Deltronic Gage Pin Sets and Gage Pins. 24” x 36” x 6” Granite Surface Plate w/ Roll Stand. Mojave 24” x 36” x 3.5” 2-Ledge Granite Surface Plate w/ Stand.